Tauriel: Wood elves love best the light of the stars. Fili: I always thought it is a cold light, remote and far away. Tauriel: It is memory, precious and pure. Last Sunday’s episode of Cosmos took up one of the best arguments against young-earth creationism—the existence of light from stars that are thousands of light-years away. Light, Neil deGrasse Tyson explained, is a time machine, giving us a glimpse at the ancient past. 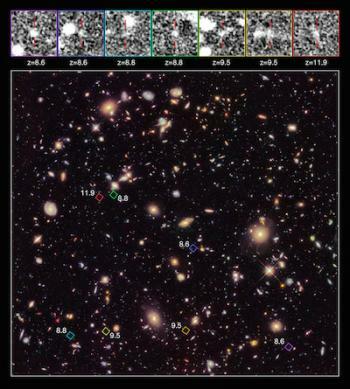 In these distant stars we see pictures of a universe that was already ancient long before young-earth creationists would claim God created the heavens and the earth, separated the light from the darkness, or created lights in the firmament of the heavens. The mind which realized that some stars are much farther away than others, and the first eyes to see stars in distant galaxies, belonged to William Herschel, a German musician and conductor who learned to grind telescope lenses, ultimately becoming the Royal Astronomer. As I mentioned last week, Herschel trained and collaborated with his sister, and she carried on his work after his death. She was also a mentor to her nephew John Herschel, who, with William, featured in this episode of Cosmos (unlike Caroline, whose absence was disappointing). Through his spectacular telescopes, Herschel was able to see the relative positions of stars, planets, comets, and distant galaxies, and understand just how big the universe was. He speculated about the possibility that there might be planets orbiting other stars in other galaxies, and that there might be astronomers on those planets looking back at him. The idea that space had depth let him see that time, too, had depth. The term “deep time” is a later invention, but the Herschels understood that what they saw through their telescopes was a glimpse deep into the past history of the universe (or “universes,” since that’s how he referred to the many galaxies). Neil deGrasse Tyson pointed out the problems this causes for creationists, explaining, “To believe in a universe as young as 6- or 7,000 years old, is to extinguish the light of most of the galaxy.” In his debate with Ken Ham, Bill Nye made a similarly forceful objection to young-earth creationist astronomy. Creationists are well aware of the objection that the universe can’t be less than 10,000 years old if we can see light from stars that has been in transit for many times longer. So what do they say in response? if God created the light beams already on their way, then that means none of the events we see in space (beyond a distance of 6,000 light-years) actually happened. It would mean that those exploding stars never exploded or existed; God merely painted pictures of these fictional events. It seems uncharacteristic of God to make illusions like this. Other creationists insist that this is entirely characteristic. Adam and Eve weren’t, by most young-earth creationist accounts, created as fertilized zygotes who developed into adult humans over a couple decades; rather, those first humans (and the animals and plants) were created as adults (thus yielding endless debates about whether Adam and Eve had belly buttons). Similarly, the wine which Jesus created from water is described as good wine, which these creationists insists means the wine was created not just as if it had time to ferment from grapes that never existed, but also time to have been aged in a cellar. Thus, these young-earth creationists insist, creating light in transit from stars that never existed wouldn’t be inconsistent with what we know about God’s creation. Other creationists, Barry Setterfield being the most prominent, claim that the speed of light itself has declined over time. If that were true, it would mean that light from those apparently quite distant stars could have gotten here in less than 10,000 years. Changing this crucial scientific constant would also increase rates of radioactive decay, explaining away the apparent conflict between young-earth chronologies and radiometric dating. The downside is that this would result in enormous rates of radiation in the early days after creation, and Adam and Eve would’ve burned to a crisp before they had time to die of radiation poisoning or cancerous mutations. Jason Lisle doesn’t dismiss the notion outright, but acknowledges that “the impact of a changing speed of light on the universe and life on earth is not fully known,” and claims “Some creation scientists [sic] are actively researching questions relating to the speed of light.” If it were true, it would also require uprooting all of physics, but that’s par for the creationist course, and hardly worth noting. To our knowledge, not one person competent in general relativity and cosmology theory who has examined Starlight and Time has given a “pass” to this theory. Despite the lack of expert corroboration of his work, Humphreys continues to insist on the validity of his demonstrably false theory. Unfortunately, most of the major young-earth organizations are continuing to follow Humphreys and are ignoring the demonstrations of the falsity of his theory which have arisen from both inside and outside the young-earth movement. As an alternative, Lisle then proposes using a different convention for synchronizing time relative to stars, Earth, and the light itself. In practice, making this work would mean adopting rather bizarre (and potentially impossible) interpretations of physics, but, again, this is can be said of most creationist attempts at science. One of the most overlooked assumptions in most arguments against the Bible is the assumption of naturalism. Naturalism is the belief that nature is “all that there is.”…But God is supernatural and is capable of acting outside natural law. It is perfectly acceptable for us to ask, “Did God use natural processes to get the starlight to earth in the biblical timescale? And if so, what is the mechanism?” But if no natural mechanism is apparent, this cannot be used as evidence against supernatural creation. It is this sort of reasoning that renders creationism a pseudoscience at its best. There’s nothing inherently wrong with proposing testable hypotheses about a changing speed of light or other physical mechanisms that might mean astronomers have overestimated the age of the universe, even by six or seven orders of magnitude. William Herschel, like astronomers before and after, proposed a number of speculative, even outlandish, ideas, but he was careful to back those speculations up with evidence, and was ready to acknowledge error if the data didn’t bear him out. But when creationists’ claims fall apart, their response is to step outside of science and insist that the falsified ideas are still true just…well…because. And that’s cheating.